Author: Wright, Richard B. Set In . . . In a small town in Canada, Clara Callan reluctantly takes leave of her sister, Nora, who is bound for New York. It's a time when the growing threat of fascism in Europe is a constant worry, and people escape from reality through radio and the movies. Meanwhile, the two sisters -- vastly different in personality, yet inextricably linked by a shared past -- try to find their places within the complex web of social expectations for young women in the 1930s. While Nora embarks on a glamorous career as a radio-soap opera star, Clara, a strong and independent-minded woman, struggles to observe the traditional boundaries of a small and tight-knit community without relinquishing her dreams of love, freedom, and adventure. 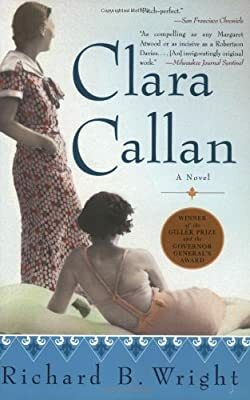 However, things aren't as simple as they appear -- Nora's letters eventually reveal life in the big city is less exotic than it seems, and the tranquil solitude of Clara's life is shattered by a series of unforeseeable events. These twists of fate require all of Clara's courage and strength, and finally put the seemingly unbreakable bond between the sisters to the test.